The Double Faucet Party Kegerator Conversion Kit comes equipped with a pro series dual gauge regulator, a D system keg coupler with a lever handle, a part faucet assembly, and a Y splitter for faster dispensing. 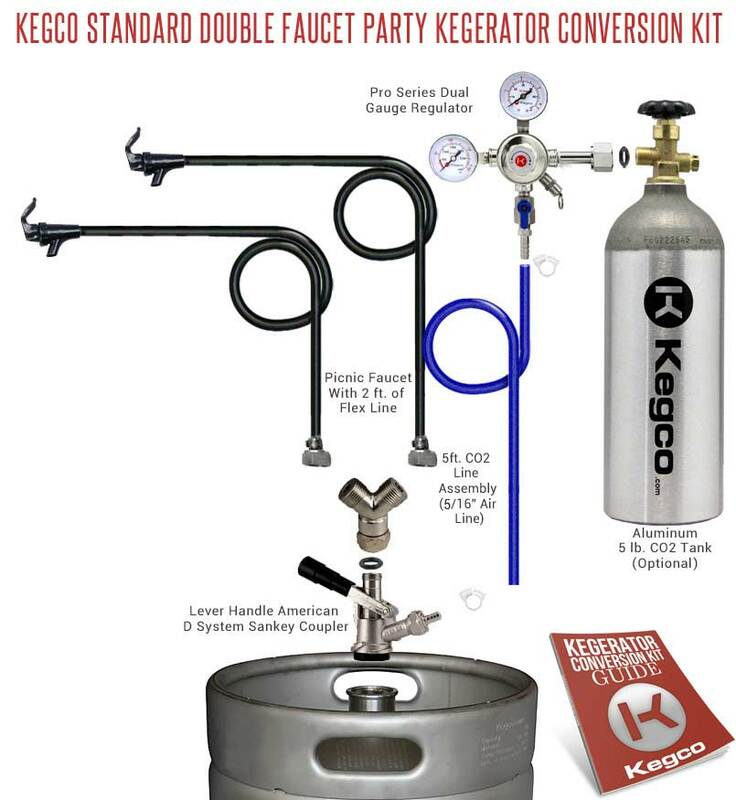 The Kegco S2PK Standard Double Faucet Party Kegerator Kit works great as a party pump for a one night event when the keg is on ice, or it can be a fast and easy solution to having a kegerator in your home without having to drill through your refrigerator. As a party solution, it is superior to keg pumps in that you no longer have to pump the keg by hand. Gone are the days of having to hold your cup and the faucet in one hand while pumping with the other. Simply grab your cup and pour! And with the double faucet setup, two people can pour at once, reducing long lines at the keg. Better make sure your backup keg is ready because the beer will go fast!As a kegerator, There are no shanks or towers to be installed with this configuration. All you have to do is have a refrigerator large enough to hold 2 1/6 gallon kegs. This is the perfect party solution and your beer will not go flat if you cannot drink it all in one night. All the draft beer parts are of the highest commercial grade quality which are designed and built to last. No Installation Required with the Standard Double Faucet Party Kit. The Beer Y Splitter included in this kit will allow you to attach two party faucets to the same keg, meaning you'll be able to dispense beer faster and keep lines of thirsty drinkers down. It is constructed of 304 grade stainless steel and adds 2-1/2" to the height of the keg coupler.